If You're Looking for information about the Central Coast of California you are in the right place. We are in the middle of Summer 2011 on the beautiful Central Coast of California and life is exciting and cool. Thousands of visitors are flocking to our communities to get out of the heat or to enjoy a spectacular vacation. Central Coast Travel Adventures has more information regarding the coastal towns than any other site. This site is different from other travel sites. Central Coast Travel Adventures will give you insights, opinions and directions no other site provides. We live on the Central Coast in Cambria, California which is one of the greatest places in the world to visit and live. It is amazing how much there is to do and see along the coast. Each page on our site is packed with valuable information about the towns, attractions and services offered on the coast. We will use our own experiences and travels to point you to the best wine tours, restaurants, shops, services, attractions, events, camping, beaches, real estate and much more. We know you will benefit from our excursions and advice. We look forward to giving you the best information about the spectacular Central Coast of California. Please take a look at the nav-bar to the left or the table of contents at the bottom of the page and select your subject of interest and dive in. 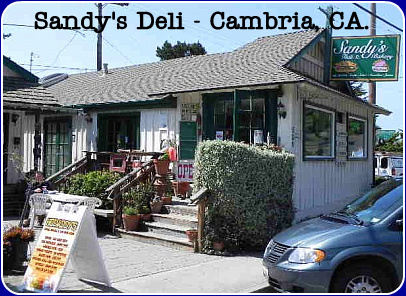 Our Featured business for the Month of August is Sandy's Deli in Cambria, California. 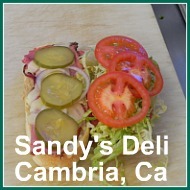 If you are looking for some great food and pastries try Sandy's Deli in Cambria. If you have a business, event or organization you would like to feature please contact us for prices. The Adventure Begins Here! Central Coast Travel Adventures "The Blog" provides you with all the latest information from the Central Coast of California. Cambria - The Home of Moonstone Beach! Cambria, California - Paradise in California! Cambria, my home, one of the most beautiful towns on the central coast. Need inside information? Come visit our site for the inside information. How would you like to live here? Los Osos - The Valley of the Bears! Los Osos - The Central Coast's concealed jewel. Specatular views of Morro Bay and the Pacific. Montana de Oro State Park, located close to the town, is totally awesome. Pismo Beach, California - Pismo Beach is home of the only SVRA beach in California. Pismo Dunes which is now called Oceano Dunes in only one part of Pismo. Come visit for more information.! Cayucos - Surfing, Wooden Indians and a Long Pier! Cayucos, California - The term laid back is used to describe this little central coast surfing village. If you like sand and suds this is the town for you. And is it dog friendly? How would you like to live here?. Ragged Point - Breath taking sites and one great coffee shop. If you have never been to Ragged Point, California please let us introduce you to the view. San Luis Obispo, California - A Great Place to Vacation! San Luis Obispo, California - San Luis is one of the countries best places to vacation or live. If you looking for fantastic shopping, food and fun then come visit for personal information and tips. Avila Beach, California - Hot Springs, Port of San Luis and Apples! Avila Beach, California - Hot springs for the body, golf courses and apple farms. In addition, Avila has pumpkins, goats and The Old Port of San Luis. Come visit for more info. Morro Bay - The Fishing Village with a Rock! Morro Bay, California - Would you like to see a Sea Otter in the wild? This little, working, fishing village has it all. Home of the Rock, the Stacks, Fishing Trips, Whale watching, great shops, food and MUCH MORE. Big Sur California - If you want to create amazing memories, explore mysterious coves and behold unbelievable views of the Pacific, Big Sur is the place to visit. Harmony California - The Home of 18 People! Harmony California - This is a town with an interesting history of milk, glass and Randolph Hearst. If you want to learn more come visit today. San Simeon - The Home of Hearst Castle & More! San Simeon, California - The home of the most famous castle in the world, Hearst Castle This little town has more than the castle. Come visit to find out more information. Central Coast Wild Life Zoo - Charles Paddock Zoo! Central Coast Wild Life Zoo - The Central Coast of California has a neat little zoo. The Charles Paddox Zoo is located in Atascadero, Ca. Would you like to see a Tiger up close? You have to take a look at these pictures, come visit. Central Coast Weather - The weather on the Central Coast of California changes from town to town. It can be a cool 59 in Cambria, Ca and 105 in Paso Robles, Ca, only 25 miles away. For more information come visit. Central Coast Camping - Camping on the Central Coast of California is the adventure of a life time. Come visit to find our more information. Central Coast Smart Travel - Do you want to know how to fly smart? In this day and time you need the inside scoop on viable flying travel tips. Come visit to learn more. Central Coast Surfing - The Central Coast of California is a great place to surf or if you are like me to old and scared to surf, you can watch. Come visit for more information. Central Coast Restaurants! - Looking for a great place to eat on the Central Coast of California? Come visit for more information on restaurants. Central Coast Events - The Central Coast of California is the events capital of the USA. For a list of current events and things to do, come visit CCTAdventures. Central Coast Travel Tips - Do you want to know the secrets behind a sucessful vacation or day trip? Tips on packing, flying, motels, pets and much more! Cambria Hiking Trails - Fern &amp; Strawberry hiking trails in Cambria, Ca. let's you get outdoors and enjoy the forest. Hiking is a popular thing to do when visiting Cambria. Come find out where the locals hike. Hiking Trails Cambria - The Fiscaline Ranch Preserve or East/West Ranch has numerous trails running through woods and along the ocean. It is a great hike with many wonders. The Embarcadero Morro Bay, CA is unique, unusal and exciting. Do you want to see a whale, visit an aquarium, eat fried fish or taste wine? Come visit for more information. The Elephant Seal - The Central Coast of California is proud to be the land based home of the Majestic Elephant Seals. The seals are located just north of San Simeon, Ca. and you can view the seals year round. Central Coast Farmers Market - The farmers show up. The vendors show up. The crowds show up and everyone has a great time. Come visit to see for more information. Central Coast Real Estate! - Do you have the dream of owning property in Paradise? Come visit for more information on coastal properties. Central Coast Zoo - Charles Paddock Zoo! Central Coast Zoo! - Tigers eyes - You have to see this picture - The Charles Paddock Zoo is fantastic. Wild Life Zoo in Atascadero, California! Central Coast Antiques - If you like to search for unique antiques the Central Coast is a rich vein of antique treasures. Come visit for more information. Central Coast Lodging - Find the Perfect Place to Stay! Central Coast Lodging - The Central Coast offers the best hotels, motels, Bed &amp; Breakfasts in the world. Select your accomodation today! Book it now! Central Coast Wines - Wine Country - The home of award winning premium wine. Do you need information on wine tours, tasting and tips from locals?. We supply the need. Central Coast Services - A Guide to Specific Services! Central Coast Services - On your visit to the Central Coast you might need a massage, chiropractor or your car worked on. We will help you find what you need. Come visit today! California Central Coast Surfing - Surfing in Cambria, California is a prime attraction. Moonstone Beach surfing? Come visit today. Camping Food Tips - The Central Coast Travel Adventures provides tips on what food to take on your camping trip. CCTAdventures offers great tips concerning camping in our area. Top Five Pet Travel Tips - Do you travel with your pets? If you do, you have to read this article. Come visit today. Lions Club Pinedorado in Cambria, California - This event is one of a kind. If you are looking for something to do on the Central Coast you need to attend the Pinedorado. How would you like to live here?. Camping Tips - The Central Coast offers great camping. CCTAdventures offers great tips concerning camping in our area. Elderly Travel Tips - Senior citizens love to travel and we have a few tips to help you enjoy your trip to the Central Coast of California. Cambria Events - Fairs Festivals and Fun - Our little town is host to many fairs, festivals and shows. The Scarecrow Harvest Festival is a great event, come visit for more information. Travel Planner - CCT Adventures provides a unique travel planner which provides a psychological advantage for having a great vacation or day trip to the central coast of ca. Top Ten Safety Travel Tips - Travel to the Central Coast of California is exciting and fun but you must stay safe. To learn more come visit. Moonstone Beach - Cambria, CA - This unique beach in Cambria, CA is the perfect place to surf, search for treasure, watch the sunset or just relax and watch the whales. California Attractions - FUN THINGS TO DO ON THE CENTRAL COAST! California Attractions - Want to know the fun things to do on the Central Coast of California? You are in the right place. Come visit and we will give you the inside scoop. Tent Camping Tips - Tent Camping on the Central Coast of California is one of the most relaxing and exciting ways to escape from the busy days in the city. Come visit for more information. San Simeon California - Leffingwell Landing is part of San Simeon State Park and a great place to picnic and enjoy the Pacific Ocean. For more information come visit. Piedras Blancas Lighthouse - This lighthouse is a popular attraction on the Central Coast of California. Come visit for more information. Cambria's Historical Museum - The Guthrie-Bianchini House is one of the oldest homes in Cambria. Today it is a museum. Come visit for more information. Cambria California - Talk about weird houses - The house on Nit Wit Ridge in Cambria, Ca. leads the way in weird houses in world. Come visit for more information. The Monarch Butterfly - This beautiful creature travels 1000s of miles to make Pismo Beach, California its winter home. Come visit for more information. Kids Travel Tips - Traveling with kids can be a challenge. If you are traveling with children you have to read this article. Come visit today. Cambria Farmers Market - The Farmer's Market in Cambria, California is a great place to purchase fresh fruit, veggies and other items. Come visit for more information. California's Highway 41 - A Great Adventure! California Highway 41 - This state highway from Morro Bay to Atascadero is a great way to spend an day. Avacado farms, orange groves, canyons and a zoo are located on this highway. For more information come visit. Central Coast Art - If you love to explore the wonderful world of art then the Central Caost of California is the place to visit. For more information come visit. Lake Santa Margarita - Fun, Fishing and Floating! Lake Santa Margarita - Do you want to do some fresh water fishing, enjoy some fresh air or go boating on your visit to the Central Coast? Santa Margarita Lake offers a wide variety of water activities. Come visit for more information. Antique Jewelry by Judith Larmore of Cambria. Judith designs unique Revival Antique Jewelry in her studio behind Santa Rosa Creek Chapel. For more information come visit today. Cambria Sea Glass - Jewelry From the Sea by Amy! Sea Glass Jewelry made by Amy Reese. Amy is an artist who lives in Cambria, California and walks Moonstone Beach daily in search of treasure. Come visit to hear the rest of the story. Budget Travel Tips - You can enjoy a trip to the Central Coast of California even if you are on a limited budget. Come visit to find out how. Cambria Ca - Moonstone Beach Fun! - Load up the babies, the grand kids, grand parents and head to Moonstone Beach for some fun. Come visit for more information. Morro Bay Ca - Parade of Boats! Morro Bay Ca - Parade of Boats! - Christmas in Morro Bay California results in a parade of lighted boats in the harbor, great fun and food. Take a look at the video! Tilley Hats Plus - Cambria Wildwood! Tilley Hats Plus Much More! - Cambria Wildwood is the Central Coast largest dealer of great hats, Brighton Jewelery and much more.. Come visit for more information on shopping. Web Design - Affordable Websites! Web Design - Affordable website design for small businesses, organizations, or individuals who are too busy to build their own site. We can help come visit. About Us - The people behind the site! About Us - The people behind Central Coast Travel Adventures and company information. Advertising Rates - Most Wanted Response! 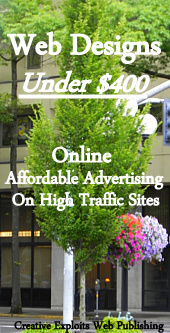 Advertising Rates - Advertising rates for Central Coast Travel Adventures. Contact Us - The people behind the site! Contact Us - The people behind Central Coast Travel Adventures and company information. The Local Business Center - Cambria, Ca.! The Local Business Center - Cambria, Ca! - In need of copies, faxing, shipping etc. Cambria Business Center is the solution. Come visit for more information on shopping. The Central Coast Travel Store! Central Coast Travel Store! - Our store is offering great prices on travel items and vacation deals. Come visit for more information on travel products. Wine Tasting Etiquette! - What you should know about the art of tasting wine. Wine tasting is an art. The Central Coast of California offers a multitude of great wine events. Come visit for more information. Beach Glass on Moonstone Beach! Beach Glass or Sea Glass hunting! Want to go on a treasure hunt? Moonstone Beach in Cambria, Ca has Beach/Sea Glass and other treasures waiting to be found. Come visit to learn more. California Wine Country! - What you should know about the production of wine in California? The facts about wine development on the Central Coast is interesting. Come visit for more information. Wine and Food Pairing! - Do you know which wine to select with your dining experience? Read the ten commandments of food and wine pairing. Great information, come visit to read the full article. Wine Tasting Tips! - Tips on wine tasting for the average Joe. Do you did a little help knowing what to do at a wine tasting event? Come visit for more information. Hiking California - The Velencia Peak Trail! Hiking California! - The Velencia Peak Trail is a great hike. You get to run from the Bears in Los Osos. Come visit for more information on this hike. California Hiking - The Oats Peak Trail! California Hiking! - The Oats Peak Trail is a great hike. This trail starts at Spooners Cove in Los Osos, Ca. Come visit for more information on this hike. California Hiking Trails - The Point Buchon Trail! California Hiking Trails! - The Point Buchon Trail is a moderate hike and offers spectaular views. Come visit for more information on this hike. California Hikes - The Bishops Peak Trail! - If you like to hike in the State of California - Los Oso and Montana De Oro State Park provides great trails!. Come visit for more information on this hike. Sand Dollars - The Hunt is On! Sand Dollars - Hunting for treasure on the beach in Morro Bay is an adventure you don't want to miss. Come visit for more information. Morro Bay Beach - On your visit to the Central Coast of California make sure to visit this wonderful beach. Come visit for more information. 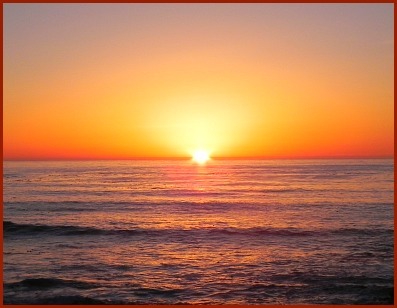 Sunset in California - Have you ever seen the green flash at sunset? Come visit for more information. Hwy 46 - Scenic and Dangerous! Hwy 46! - If you want to tantalize your eyes and thrill your soul take a drive on 46 between Cambria and Paso Robles, Ca. Come visit for more information. Seal Elephant - Birthing Time! Seal Elephant - Birthing Time. The Elephants of the sea are giving birth in San Simeon, California. Come visit for more information. Old Stone Station - A Cambria Restaurant! Old Stone Station - Cambria, Ca. Visiting the Central Coast of California and want a great meal? Come visit for more information. Whale Watching Tours! - If you want to experience the greatest adventure on the central coast go whale watching with Virg's Landing. Winter Camping Tips - Camping on the Central Coast of California is an adventure. Come visit to find out how. Pacific Coast Highway - Hwy 1! Pacific Coast Highway - Hwy 1, is absolutely fantastic along the Central Coast of California. The drive is an adventure all in its self. Come visit for more information. Decanting Your Wine! - What you should know about decanting wine? To learn more about this art come visit for more information. Cambria Boardwalk Hikes! - How about a stroll down the boardwalk on Moonstone Beach. It is one great hike for anyone to enjoy. Come visit for more information on shopping. Sport Fishing Charters on the Central Coast! Sport Fishing Charters! - The Central Coast of Ca. is the place to charter a boat and go deep sea fishing. Come visit for more information on shopping. The Paso Wine Festival Experience! The Paso Wine Festival! - The 29th annual festival of wine is being held May 20-22nd 2011 in Paso Robles Ca. Come visit for more information. Fresh Fish for Dinner! - You are visiting the Central Coast and want some fresh fish for dinner. Come visit for more information. Beach Exercise on the Central Coast! Beach Exercise on the Central Coast! - Get fit and enjoy the beach, sea and sand all at the same time. Come visit for more information. Hike Big Sur, California! - This area offers some great hiking opportunities. Make sure to bring your hiking boots. Come visit for more information. Bubble Gum Alley! - In San Luis Obispo, California two walls you will not believe. You have to see this to believe it. Come visit for more information. Cayucos California - The Frontier Surfing Village! Cayucos California! - The frontier Surfing Village on the Central Coast of California -Spectacular! Come visit for more information. Auto Repair Services - Gerber's Auto Services in Cambria, California since 1981 - The Best Mechanics in the business. Tin City Cambria California! - Most services, auto, printing and even cookies are made in this area of Cambria,Ca. Come visit for more information. The Great Blue Heron! - The Central Coast of CA is rich in wild birds and the spectacular Heron is one of them. You have to see this to believe it. Come visit for more information. The California Sea Otter! - This wonderful creature can be found in Morro Bay, Ca. Come visit for more information on otters. Cambria Walking Trail! - This trail in Cambria was really cool. Come visit for more information. Family Hiking Adventure! - This adventure is about the Harmony Headlands State Park on the Central Coast of California. This is one great hike for the family. Come visit for more information. Hiking Trail - The Bill Kern Trail! Hiking Trail! - The Bill Kern Trail in Cambria California provides adventure in the wild woods and a breath taking view of the sea. This is one great hike for the family. Come visit for more information. Creekside Gardens Cafe - Cambria, CA! 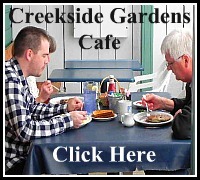 Creekside Gardens Cafe - If you want a great Breakfast, Lunch and Patio Dinning Creekside is the best. Located in Cambria, California. Come visit for more information on this great Central Coast Restaurant. The French Corner Bakery - Cambria, CA! 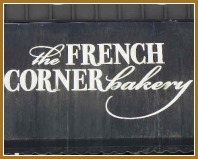 French Corner Bakery - This fantastic French Bakery is located in Cambria, Ca. and they specialize in Cakes, Desserts, Sandwiches and much more. 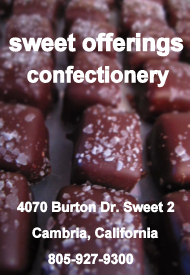 Come visit for more information on this great Central Coast Bakery etc. 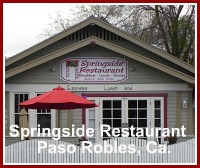 Springside Restaurant - Paso Robles, CA! Springside Restaurant - If you want a great Breakfast, Lunch or Dinner this restaurant is the best. Located in Paso Robles, California. Come visit for more information on this great Central Coast Restaurant. Sandys Deli & Bakery - Cambria, CA! Sandys Deli &amp; Bakery - Sandy's specializes in sandwiches, soups, salads, smoothies, speciality coffees and much more. Come visit for more information on this great Central Coast Bakery etc. Hodaddys Cambria, California - Looking for cool apparel and laid back goods? This is the place to shop. Hodaddy's has a wide variety of cool clothes, hats, boots and much more. Cambria Cappuccino - The Best Little Coffee Shop in Cambria! 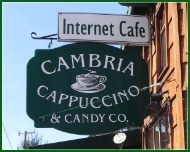 Cambria Cappuccino - This little coffee shop is located in the West Village in beautiful Cambria, Ca. Come visit for more information on this great Central Coast Coffee Shop. Lake Nacimiento - A Fresh Water Adventure! Lake Nacimiento - A Fresh Water Experience! This beautiful lake is located outside of Paso Robles, California. If you are visiting the Central Coast of California and want to do some fresh water fishing this lake is the spot. Come visit to learn more. California WildFlowers! Can you Smoke em? California WildFlowers - Spring is absolutely fantastic along the Central Coast of California. The flowers are an adventure all in themselves. Come visit for more information. Big Sur Travel Tips! - Big Sur California is as dramatic and unconventional as it is isolated. Ninety miles of rugged coastlines, spectacular scenic views, the natural beauty of its beaches and its wilderness, and its unconventional personality will enthrall you and have you coming back for more.. Come visit for more information. All American Cambria - This company provides video rentals and electronics accessories for Cambria, Ca area. Come visit for more information on this great Central Coast Business.